You are Christ, appearing as you (insert your name). 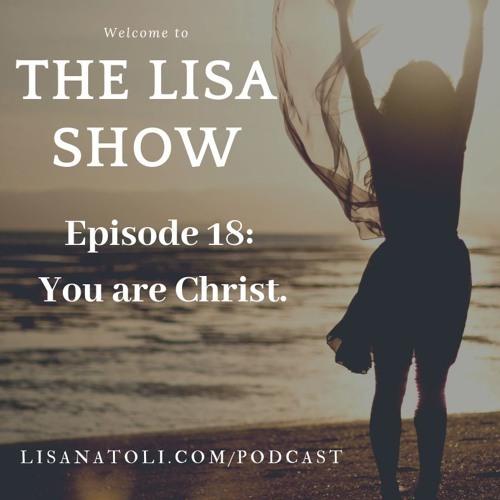 In this episode, Lisa Natoli talks about the end of the idea of "being a channel" for love. YOU ARE LOVE. You're not extending love. That's only a first step. Many people say when they are extending light and love that they "are just the messenger" and that's a great leap from holding grievances, but there is another step where you become the love you are extending. Then there is no "you" that's extending. Then only Love IS extending and there is no you there. You are simply no longer blocking this love and light with fear, grievances, attack thoughts, shame, blame, guilt. Now the light is simply just flowing, and you're not blocking. @joseph-fielder-500831741: Joseph - you have JUST set me FREE! I soooo needed to read this today - I am going to let it sink in! I had a major issue with 'Father' - it is a label that got me stuck more than once. However ..... Beloved - Now I can live with THAT! Thank you so very much! @joseph-fielder-500831741: Hey Joseph! Oh this is awesome. I will check out that guy Rocko Erico. Our minister at Unity, Shipley Allinson was super big into the Aramaic translation of the bible and Bill and I took a couple of classes with her on it. SO INTERESTING !!!! I love you. Thanks for listening Joseph and thanks for this post, and thanks for gracing our home with the most out of this world art pieces!!!! Hey Lisa, Nice. I enjoyed every minute. Been attemting to share with you and Bill something I found interesting. Some years ago I was attending a service at Arlington Metaphysical Chapel near D.C. The Rev. Reed Brown my friend. He had a guest speaker Rocko Erico, who is the world leader in Aramaic translation and he shared with us that day that the word Father in Aramaic means Beloved. Two sisters could be having a conversation and say to each other Father I Love You! and that would be perfectly understood not geder specific at all. I was thrilled to learn this and wanted to share. I Love TOGF Thank you for being!